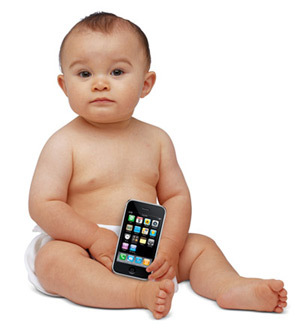 If you weren't already blown away by Apple's impressive sales figures yesterday, then consider this astonishing fact: Apple sells more iPhones each day than there are babies born in the world. The Cupertino company revealed during its quarterly sales call yesterday that during the first fiscal quarter of 2012, it shifted a staggering 37.04 million iPhones — far more than any other smartphone manufacturer. On average, that's roughly 377,900 iPhones sold per day, or 262 per hour, according to our calculations. If those numbers are correct, and we believe that they are, Apple is now making iPhones at a rate that exceeds the amount of babies that humans produce on earth every day. This number is likely to be transient as the birth rate isn't static and Apple's first quarter normally gets a bump in sales from the Christmas shopping season which subsides in the second. But even though that figure is likely to drop a little during the next quarter, I think you'll agree that it's still pretty amazing. And it has helped Apple to become the world's top smartphone manufacturer. Are you impressed by Apple's iPhone sales figures?